I currently live in a suburb just outside of Boston, MA with my husband Mike and our golden retriever, Jax. I believe that you can nourish your body and your mind through food. I believe ultimately in listening to your body. Listening and noticing signs that can help you better yourself to be a healthier and happier person! I believe in eating to fuel yourself with proper nutrients to give yourself the energy you’ll need for your day, and feeling the best you possibly can each and every day. I do not think any specific diet is a one-size fits all, and you have to eat for your lifestyle and for what works for your body- nobody else. Why did you start LCK? 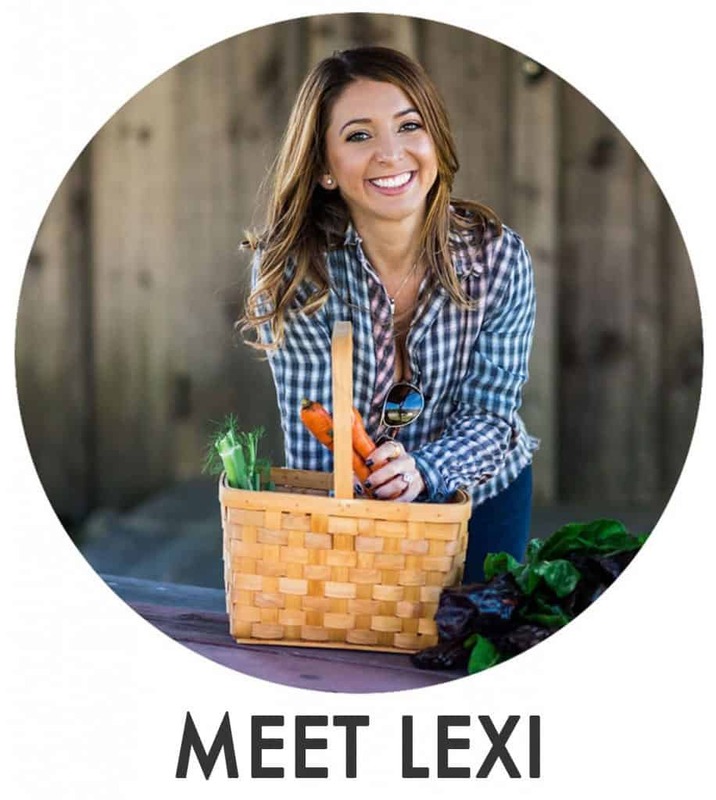 I started Lexi’s Clean Kitchen in mid-2013 after a necessary diet change for my health. I still wanted to be able to eat my favorite foods, though! I started LCK to share my clean, healthy, and allergy-free recipes to inspire others that living a healthy lifestyle can in fact be fun and exciting, and never has to be boring. My ultimate goal is to help others achieve a balanced lifestyle, full of whole foods and free of limitations! How has changing your diet helped other areas of your life? Changing my diet has had a huge impact in so many areas of my life, other than gut health. I became more confident, more energetic, slept better, performed better in my day-to-day tasks, and overall felt better in my skin! How can I eat clean and not spend a fortune in the grocery store? Two ways: First: Shop local! Look for a local CSA, get your market’s flyers, find a local butcher or farmer. Do some research in your area for the best prices! Secondly: Shop for pantry items online or in bulk if you use them often. I use Amazon and Thrive Market. What’s a typical day of eating like for you? My days eating are more simple then you might think! Often a little boring (sorry to say)! I usually start off with my black coffee and collagen protein and some eggs (and maybe some avocado slices and/or bacon). Lunch is either leftovers or something I’m cooking up that day, and dinner is a variety of blog recipes or the occasional night out or sushi take-out! I want to go ahead and say no to this one. Mainly because everyone has different views of what this means. I take the Paleo guidelines (no gluten, grains, dairy, refined sugar, soy- and eating real whole foods, without the processed foods). I adapt these guidelines for my life. For example, sometimes I’ll eat white rice or white potatoes because they are fine for me and my body! I also can tolerate some dairy, so I do so when I feel like it! Technically, yes I eat Paleo- but I try not to put labels on the way I eat! As of June 23rd, 2015, YES, and I am grateful everyday that I was able to make blogging into a career! Read more about that here. How did you balance your time between your full-time job and blogging? Balancing my time was hard, I won’t lie to ya. I often felt like I needed a vacation, which means I was overworked and tired. I did a lot of blogging in the mornings and on the weekends. When I was able to, I brought people on my team to help me in areas that were being neglected. Now, I’ve started incorporating meditation into my day-to-day and am starting to set aside some more me time. Yep, I actually have been reading for leisure at night these days! Man, has it has taken a while to get there! When I started the blog, I spent most waking hours writing, editing, troubleshooting, and so on. I still work my tush off day in and day out, but not balancing two full-time jobs has definitely helped my sanity! I want to start a blog, where should I start? I wrote a post outlining how to start a blog in 5 simple steps! You can also refer to the Blogging Resources page for more information! Gluten, grains, dairy, soy, corn, and refined sugar. What’s your favorite thing(s) to eat in general? Hmmm… probably breakfast food and sushi! If you could offer once piece of advice for starting to eat clean/eliminate foods from my diet, what would they be? It’s not an all or nothing approach! You need to make it work for YOUR lifestyle. Ease into it and don’t expect overnight results. It will take time for you to heal your body or totally feel your best! J Louis Technology and I could not recommend them more! Definitely! I love hearing from you. Email me at Lexi@Lexiscleankitchen.com. I might take a bit to get back to you, but I promise I will! I try to respond to each and every email. We got married August 20th, 2016! Find the recaps here: part 1, part 2, welcome bags, registry must-haves, and honeymoon! Do you work with brands on sponsored posts and campaigns? 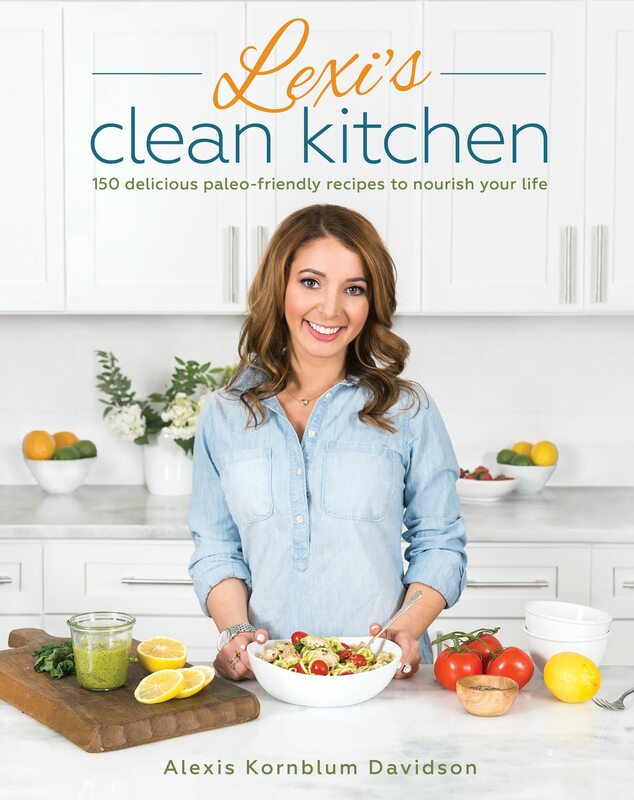 My debut print cookbook, Lexi’s Clean Kitchen, hit shelves on November, 8th, 2016! 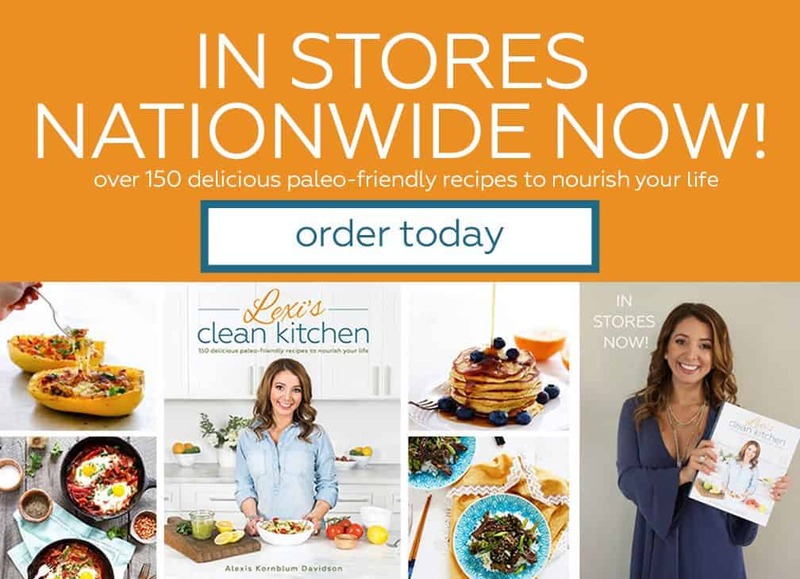 The 400-page, 150+ recipe book can be found in stores nationwide at Barnes & Noble, Indigo, etc., and is available for online shipment via Amazon, Target, Indigo, and Barnes and Noble. What's one fun fact about you? I’m a shorty- 4′ 10″! For full recipes I do not allow republication of my recipe without prior consent. Why? Simply because when you copy and paste my recipes and republish elsewhere, it will negatively affect how LCK gets picked up in search engines. Aside from that, there are some copyright infringements that copying a recipe would cause, and lastly, because I put time into my work and like to see them stay here! If you have a specific inquiry about a recipe, definitely feel free to email me. For photos without the recipe, absolutely! Simply credit the photo with a link back to where readers can find the recipe on here! I made your recipe and it didn’t turn out right- what did I do wrong? I’m not sure, but I can try and help you troubleshoot. First, check out the comment section. Often others shared what worked or didn’t work for them. Sometimes a step in a recipe might be confusing to you, or might need clarification. Keep in mind if you substitute or make any significant ingredient changes this can and will change the recipe entirely. Shoot me an email and I can help you work out the issue. Can I substitute coconut flour for the almond flour in your recipes? No! Unfortunately coconut flour is not a 1:1 sub at all. It’s a flour that requires a ton of liquid and has extremely different properties than that of almond flour. What are your favorite recipes on LCK? Oh, let’s see! Right now I’m loving my Cookie Bars, Antipasto Salad, Thai Meatballs, Maple Glazed Salmon, Sandwich Rolls, Fluffy Pancakes, and Cauliflower Fried Rice! What do you do with all of your food? Leftovers, leftovers, leftovers. After that, friends, families, and neighbors benefit. For the past two years I have shot with a Canon Rebel with a 60mm Macro lens but just upgraded to the Canon 5D Mark III with a 100mm L macro lens and a 24-70mm. The Rebel is a good starting point if you are a beginner or just looking to explore without totally breaking the bank. I highly, highly recommend macro lenses for food photography. Thank you for being friendly, respectful, and helpful in the comments section! I love hearing from you and what you have to say! I want Lexi’s Clean Kitchen to remain as a positive environment for my readers (and myself), and therefore I will remove inappropriate, offensive, or rude comments in general.